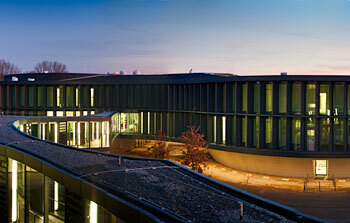 5 December 2013: On 4 December 2013, at ESO Headquarters in Garching bei München, Germany, an official inauguration ceremony was held for the new office extension. This celebration was attended by members of the ESO Council, local authorities, the architects Auer+Weber+Assoziierte, the general contractor BAM Deutschland AG and the ESO management team. 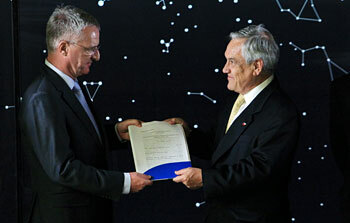 3 December 2013: ESO has received a donation of a planetarium and visitor centre at the site of its Headquarters in Garching bei München, Germany. 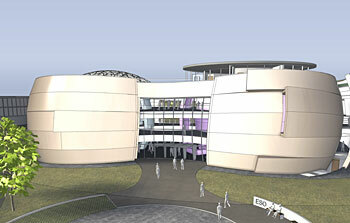 The centre will be a magnificent showcase of astronomy for the public. It will be possible thanks to the Klaus Tschira Stiftung, which offered to fully fund the construction. 27 November 2013: The Large Magellanic Cloud is one of the closest galaxies to our own. 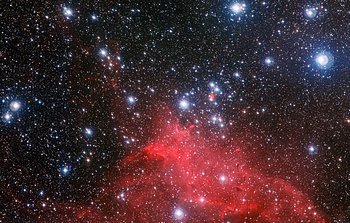 Astronomers have now used the power of ESO’s Very Large Telescope to explore one of its lesser known regions. This new image shows clouds of gas and dust where hot new stars are being born and are sculpting their surroundings into odd shapes. But the image also shows the effects of stellar death — filaments created by a supernova explosion. 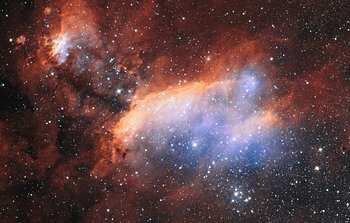 13 November 2013: Astronomers at ESO have captured the best image so far of the curious clouds around the star cluster NGC 3572. This new image shows how these clouds of gas and dust have been sculpted into whimsical bubbles, arcs and the odd features known as elephant trunks by the stellar winds flowing from this gathering of hot young stars. The brightest of these cluster stars are much heavier than the Sun and will end their short lives as supernova explosions. 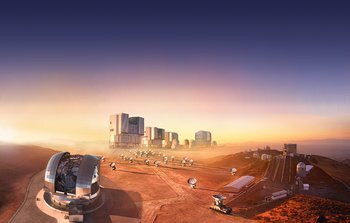 6 November 2013: Today marks the 50th anniversary of the start of a very fruitful relationship between ESO and Chile that has allowed both European and Chilean astronomy to push the boundaries of science, technology and culture forward into the future. 16 October 2013: Two international teams of astronomers have used the power of the Atacama Large Millimeter/submillimeter Array (ALMA) to focus on jets from the huge black holes at the centres of galaxies and observe how they affect their surroundings. They have respectively obtained the best view yet of the molecular gas around a nearby, quiet black hole and caught an unexpected glimpse of the base of a powerful jet close to a distant black hole. 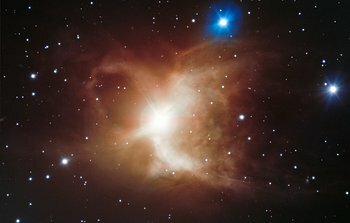 9 October 2013: ESO’s Very Large Telescope (VLT) has captured a remarkably detailed image of the Toby Jug Nebula, a cloud of gas and dust surrounding a red giant star. 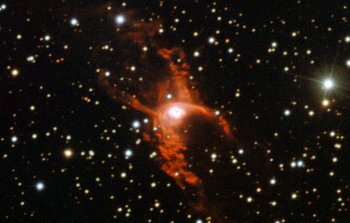 This view shows the characteristic arcing structure of the nebula, which, true to its name, does indeed look a little like a jug with a handle. 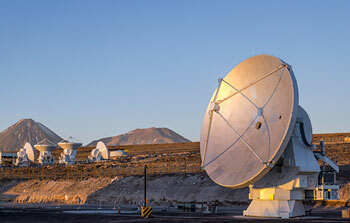 1 October 2013: The final antenna for the Atacama Large Millimeter/submillimeter Array (ALMA) project has just been handed over to the ALMA Observatory. The 12-metre-diameter dish was manufactured by the European AEM Consortium and also marks the successful delivery of a total of 25 European antennas — the largest ESO contract so far. 25 September 2013: A new instrument called ArTeMiS has been successfully installed on APEX — the Atacama Pathfinder Experiment. APEX is a 12-metre diameter telescope located high in the Atacama Desert, which operates at millimetre and submillimetre wavelengths — between infrared light and radio waves in the electromagnetic spectrum — providing a valuable tool for astronomers to peer further into the Universe. The new camera has already delivered a spectacularly detailed view of the Cat’s Paw Nebula. 18 September 2013: The glowing jumble of gas clouds visible in this new image make up a huge stellar nursery nicknamed the Prawn Nebula. Taken using the VLT Survey Telescope at ESO’s Paranal Observatory in Chile, this may well be the sharpest picture ever taken of this object. 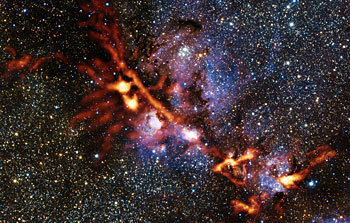 It shows clumps of hot new-born stars nestled in among the clouds that make up the nebula. 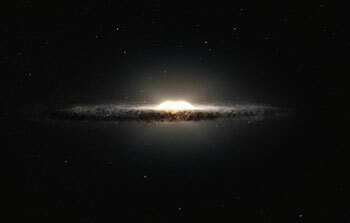 12 September 2013: Two groups of astronomers have used data from ESO telescopes to make the best three-dimensional map yet of the central parts of the Milky Way. They have found that the inner regions take on a peanut-like, or X-shaped, appearance from some angles. This odd shape was mapped by using public data from ESO’s VISTA survey telescope along with measurements of the motions of hundreds of very faint stars in the central bulge. 28 August 2013: An international team led by astronomers in Brazil has used ESO’s Very Large Telescope to identify and study the oldest solar twin known to date. Located 250 light-years from Earth, the star HIP 102152 is more like the Sun than any other solar twin — except that it is nearly four billion years older. This older, but almost identical, twin gives us an unprecedented chance to see how the Sun will look when it ages. 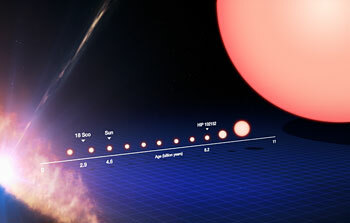 The new observations also provide an important first clear link between a star’s age and its lithium content, and in addition suggest that HIP 102152 may be host to rocky terrestrial planets. 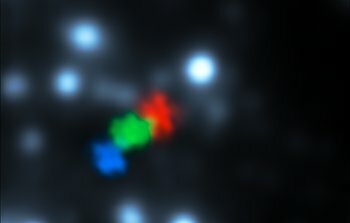 20 August 2013: Astronomers using the Atacama Large Millimeter/submillimeter Array (ALMA) have obtained a vivid close-up view of material streaming away from a newborn star. 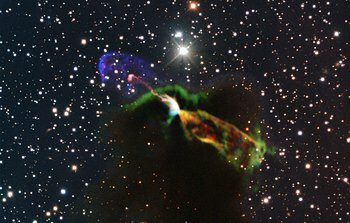 By looking at the glow coming from carbon monoxide molecules in an object called Herbig-Haro 46/47 they have discovered that its jets are even more energetic than previously thought. The very detailed new images have also revealed a previously unknown jet pointing in a totally different direction. 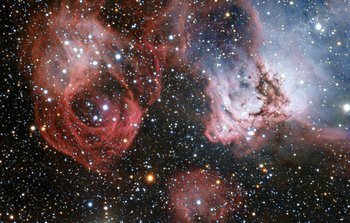 7 August 2013: ESO’s Very Large Telescope has captured an intriguing star-forming region in the Large Magellanic Cloud — one of the Milky Way’s satellite galaxies. 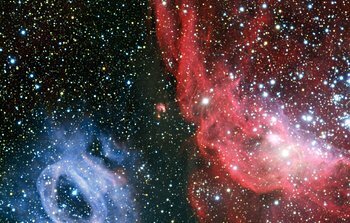 This sharp image reveals two distinctive glowing clouds of gas: red-hued NGC 2014, and its blue neighbour NGC 2020. While they are very different, they were both sculpted by powerful stellar winds from extremely hot newborn stars that also radiate into the gas, causing it to glow brightly. 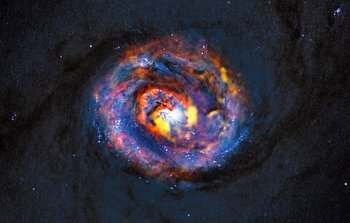 24 July 2013: New observations from the ALMA telescope in Chile have given astronomers the best view yet of how vigorous star formation can blast gas out of a galaxy and starve future generations of stars of the fuel they need to form and grow. The dramatic images show enormous outflows of molecular gas ejected by star-forming regions in the nearby Sculptor Galaxy. These new results help to explain the strange paucity of very massive galaxies in the Universe. The study is published in the journal Nature on 25 July 2013. 18 July 2013: A snow line has been imaged in a far-off infant planetary system for the very first time. 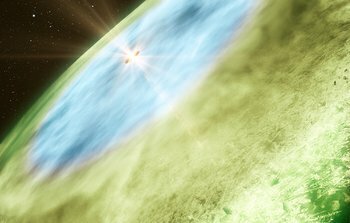 The snow line, located in the disc around the Sun-like star TW Hydrae, promises to tell us more about the formation of planets and comets, the factors that decide their composition, and the history of the Solar System. The results are published today in Science Express. 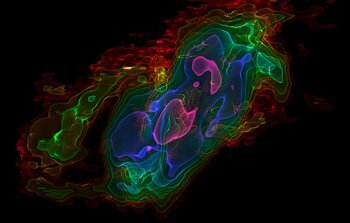 17 July 2013: New observations from ESO’s Very Large Telescope show for the first time a gas cloud being ripped apart by the supermassive black hole at the centre of the galaxy. The cloud is now so stretched that its front part has passed the closest point and is travelling away from the black hole at more than 10 million km/h, whilst the tail is still falling towards it. 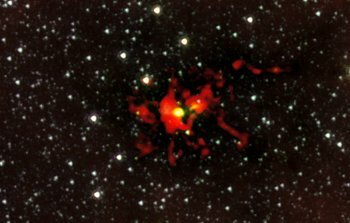 10 July 2013: New observations using the Atacama Large Millimeter/submillimeter array (ALMA) have given astronomers the best view yet of a monster star in the process of forming within a dark cloud. A stellar womb with over 500 times the mass of the Sun has been found — the largest ever seen in the Milky Way — and it is still growing. The embryonic star within the cloud is hungrily feeding on material that is racing inwards. The cloud is expected to give birth to a very brilliant star with up to 100 times the mass of the Sun.